We hear with our brains. How does it work? Find out how simple vibration becomes a bird call, a rock lyric or the blast of a jackhammer. While the outer ear is a great place to display jewelry, it’s specifically designed to transmit sound. Sound begins as motion. When objects vibrate, molecules of air are set in motion and transmitted as sound waves. The outer ear’s bell-like contours guide and focus these sound waves into the ear canal, where they’re aided and amplified by its spiraling shape. This natural phenomenon works so well we copy it to hear even better: a radio announcer cups his hand around his ear, simultaneously gathering sound in and blocking background noise out. Once inside the ear canal, sound waves travel on until they reach the eardrum, the dividing point between the outer and middle ear. When sound waves hit the eardrum, they cause it to vibrate, sending the sound on to the delicate machinery of the middle ear. Here, the body’s three tiniest bones – commonly referred to as the hammer, anvil and stirrup – mechanically advance and organize the sound to further amplify it and facilitate its passage into the inner ear. The middle ear also contains the eustachian tube, which equalizes air pressure between the outer and inner ear. The fluid-filled inner ear is where the action takes place. Here, microscopic hair cells reside within the spiral-shaped cochlea. These hair cells are stimulated by the sound wave moving through the fluid and convert that movement into nerve impulses that are sent to the brain. Our brain interprets the signals and tells us in turn that the doorbell rang, or that words are being spoken. Many things help determine just exactly what it is you hear, but it’s the combination of frequencies that give different sounds their distinctive qualities. Source and direction of the sound and loudness are other clues the brain uses to decipher messages. Sensorineural Hearing loss occurs when hair cells are damaged or die, a common occurrence as we age. And hair cells, like brain cells, do not regenerate. That’s why most sensorineural hearing losses are irreversible. 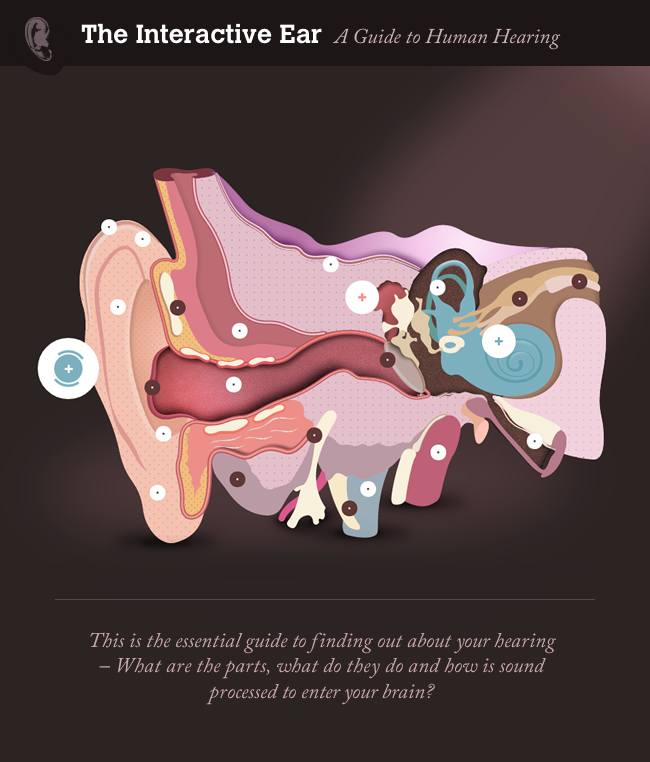 The interactive tutorial below provides an excellent overview of the human ear functions. Clicking on the graphic will open a new window.